CLUE: THE SUSPECT HAS BIG FEET. 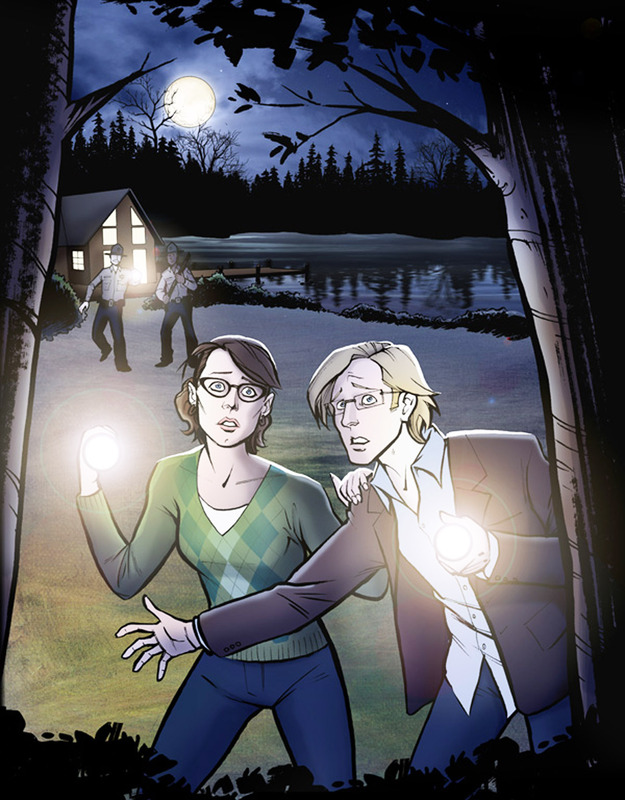 A pair of academics investigate an inhuman murderer in The Beast of Wolfe’s Bay. When you think of Menomonie, a few things might come to mind: the clock tower at UW-Stout, Neil Gaiman, or the Muppet Show song “Mahnah Mahnah” (which of course sounds eerily like the city’s name). Now an accomplished graphic novelist, designer, and illustrator can be added to the list of awesome things with a connection to Menomonie. Erik Evensen recently became an assistant professor at UW-Stout. He received an MFA in design from Ohio State University, a BA in art from the University of New Hampshire and was a grant-funded post-baccalaureate student at Boston’s School of the Museum of Fine Arts. If that isn’t impressive enough, Evensen has also served on various creative boards, has worked with major companies like Wells Fargo and Coca-Cola, and even plays the saxophone. Evensen’s portfolio is wide-ranging. He has created everything from logos and book cover designs to posters and interactive Web media. Evensen is also the author and illustrator of the graphic novels The Beast of Wolfe’s Bay (2013), Gods of Asgard (2007 Xeric Award Winner) and the educational comics-based textbook Super-Powered Word Study (2011). His work has also appeared in Ghostbusters, Zombie Bomb, Invincible, Grounded, and Fear Agent. Evensen’s most recent graphic novel, The Beast of Wolfe’s Bay, is a tale of adventure with elements of comedy, romance, and science fiction. It is also a modernization of the epic poem Beowulf. The Beast of Wolfe’s Bay follows Brian Wegman, who is a grad student and an expert in paleoanthropology, a branch of anthropology that deals with fossil hominids. Brian is asked to consult on a murder case in which there is evidence that the murderer isn’t entirely human. He joins the local police on a search for the creature to find out what it is and do what is necessary to protect the people of Wolfe’s Bay from it. And the really cool thing about this novel? Evensen created a Kickstarter campaign to fund this book and in May 2012 it was fully funded. Not only did 384 backers help him, but they gave him $16,777 – that is 335 percent of his goal of $5,000! It isn’t uncommon to see Kickstarter programs helping independent artists achieve their dreams, but to be overfunded by this amount is a commendable feat and truly shows the faith the backers had in Evensen’s ability as a storyteller and artist.